On my commute to Cornell I travel under an old railroad bridge on Route 366 near Varna, NY. As you approach the Varna you will see graffiti on the steel wall of the bridge. 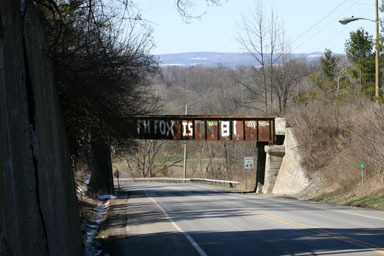 The message written in white on black now is "F. H. Fox is 87". And with each passing birthday for Dr. Fox the number is updated by the third year veterinary class of the Cornell College of Veterinary Medicine. Dr. Fox is a legendary figure of the Vet College. For many years he taught large animal medicine and surgery that required the students to make calls at various locations in the surrounding counties. Although I never met him, my neighbor for many years, Dr Alexander deLahunta told me many stories of the pranks he would pull on his students and stunts the students would pull on him. He apparently considered his birthdays as "birthday tragedies" so having his age displayed by graffiti is an appropriate ribbing by the students. The standing joke has been going on for over 22 years to my knowledge. His legendary status also goes beyond his reputation for humor. Many of his students who have gone into veterinary practice give testimonials regarding his perceptive diagnostics skills that were passed on. In 1990 a scholarship was established by his former students to honor his contributions to teaching veterinary medicine. One can Google F. H. Fox to get additional interesting details. Best wishes to Dr. Fox. I look forward to seeing those numbers keep on increasing with each "birthday tragedy". I think he would enjoy being classified as a "tough old geezer".